Audi India has launched the Audi Q3 in India on 6th June 2012 at an ex-showroom price starting Rs. 26.21 Lakhs. Audi India announced an initial batch of 500 cars in India at the launch for which the bookings were opened on the launch. Within 5 days of official launch of Audi Q3 all the 500 cars of the first batch has been sold out! This is a tremendous demand for a car which costs over Rs. 30 Lakhs on-road which is because of the high demands of the compact and entry level luxury SUVs in India and high value for money package that Q3 offers at its price point. Audi India will reopen the bookings for another batch of 500 cars towards the end of June 2012. Audi India first unveiled the Audi Q3 at the Auto Expo 2012 and since then it has been attracting a lot of attention from customers, aspiring buyers and automobile media. In terms of competition, Audi Q3 is placed directly against the best selling compact from BMW India, the BMW X1 and it surely does give BMW a tough competition in terms of styling, features and performance. 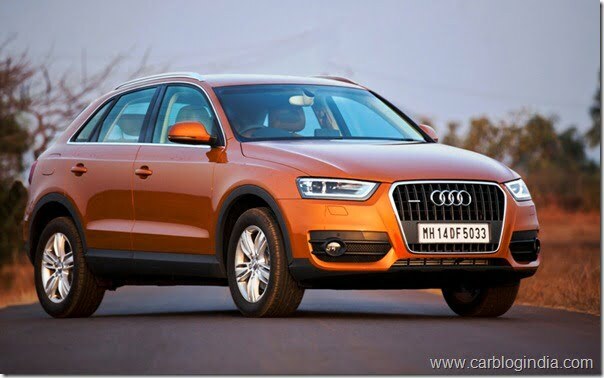 We have compared these cars in details here – Audi Q3 VS BMW X1 – Detailed Comparison. Audi India is running special campaigns to make Audi Q3 reach more audience and is also focusing on youth buyers though its catch campaigns like the “Start Young” . Audi Q3 happens to be the youngest and the most affordable Audi car in India and pitching the same with youth oriented campaigns and youth icons like John Abraham, Audi India is marketing the Q3 quite intelligently. Have you checked out detailed features and exclusive pictures of Audi Q3? Stay tuned for more updates from Car Blog India.